Right now is the time of year that people begin to worry about their vehicles. 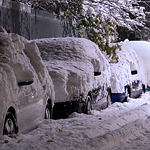 The snow and cold can cause problems, but there are some maintenance tips that can help get you through the winter season if you plan to travel out of state. Here are a few things that you should be doing to make sure that you and your vehicle are safe. Make sure that you have a winter kit with you. Extra gloves, a blanket, and a shovel can help a lot if you find yourself stranded or stuck in the snow on your next road trip. Having these essentials can help you get back on the road or at least stay warm until the tow truck comes. You should also make sure that your headlights and taillights are in good working order. Debris can get on the lights, making you less visible to other drivers. Also, since there are fewer sunlight hours, you'll need to use your headlights more.